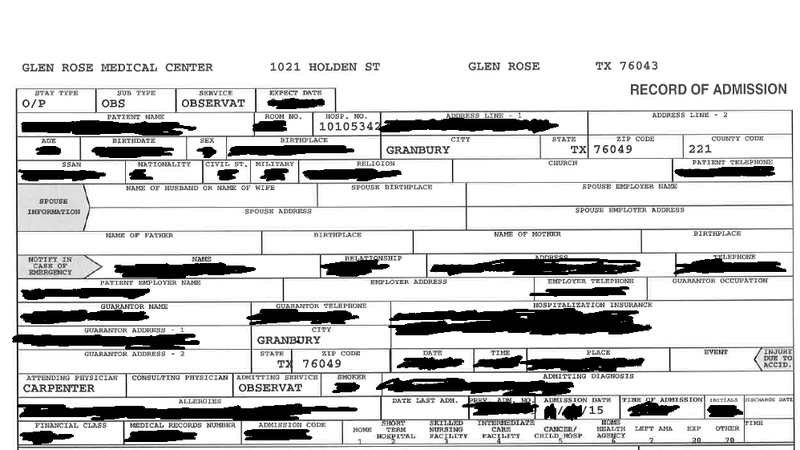 Glen Rose Medical Center posted a patient record on their web site!! Needless to say I was kind of shocked that this patient record with SSN and all was there for me to see connected as any other user could with my browser. My spouse Debbie contacted the family and notified them that Glen Rose Medical Center had posted their personal information on the Internet for anyone to see, which is how she was able to determine how to contact them. She even walked the family through downloading the document to their PC over the Internet so they had a copy themselves from the Glen Rose Medical Center web site. Assuming it was posted that same day, the patient record containing personal information was online for 585 days. Why was a patient record sitting in the CEO office, where the board packets are scanned in, at the time it was 'accidentally' scanned into the board packet by either the CEO or his assistant? This is giving them the benefit of the doubt that it was a mistake, what was the document doing in there to start with? Why didn't the CEO or his assistant check the PDF before OR after posting it? Where's the quality assurance in the CEO office at Glen Rose Medical Center? Who is going to be held accountable? Isn't the CEO responsible for this since it came from his office? Will he resign? Will the CEO Ray Reynolds report the HIPAA violation or will he try to avoid taking responsibility by not reporting? Will the board even bother to call a meeting to discuss or take any action to address the self-induced problem by the CEO for the Glen Rose Medical Center and now putting the Somervell County Hospital District at risk because of possible fines that may be forthcoming? Do you trust Glen Rose Medical Center with your data knowing this has happened to at least one person in the community? I would suggest actually reading the Joint Commission Report but you are now warned that you may not feel so safe going to GRMC after doing so because there is a lot of the 'Insufficient Compliance' in there that may bother you.